Fig. 1. One compound eye of the water strider and the detailed structure of three NS. insect body surface. Exocrine glands with pores appearing between adjacent ommatidia, the hexagonal units that constitute the compound eye, are termed as interommatidial exocrine glands. 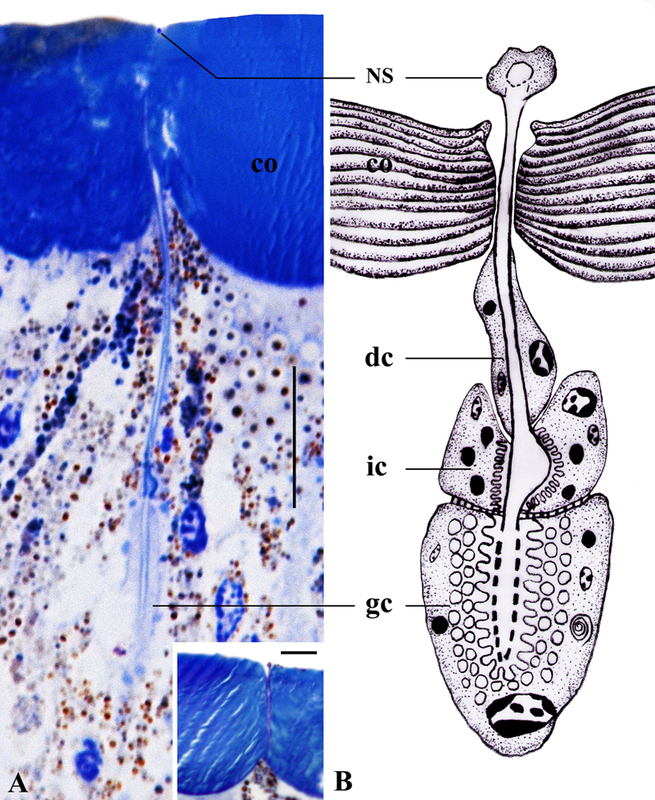 Here, we describe a novel interommatidial exocrine gland found in the compound eyes of the water strider Aquarius remigis. The pore region of the gland is characterized into a hollow “nail-headed” structure (NS). It is like a spray head mounted on one end of a pipe, only much smaller. The NS is 2 μm long and the opening pore is just 0.5 μm in diameter (Fig. 1). Below the NS lies three cells: a basal gland cell, an intermediary cell and a distal duct cell. The gland cell and the intermediary cell are secretory and produce the secretion of the gland. The duct cell forms the canal guiding the flow of the secretion. 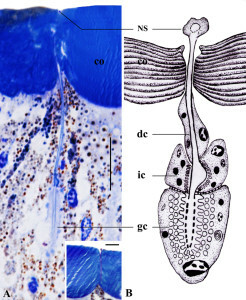 We found that no musculature or blood vessels are around the gland, which raise the question: what force drive the secretion forward in the canal? The gland cell forms a large number of finger-like projections (microvilli) circumferentially surrounding the other end of the canal. These microvilli are able to contraction due to the present of actin and myosin filaments. Coordinated contraction of these microvilli may generate a pumping pressure to push the secretion through the duct and out of the gland. Unfortunately, the actual functions of the secretion produced by this gland is unclear. However, given the peculiar site (compound eyes) they are located, it is likely that they produce anti-fungal and anti-bacterial materials that keep the clarity of the eye surfaces. An interommatidial exocrine gland with a “nail-headed” structure in the water strider Aquarius remigis (Hemiptera, Gerridae).